Nov 3 – This is a village of 3,525 people, 96% of whom grew up speaking French as their mother tongue. It is completely surrounded by the administrative municipality of Saint Cyprien, which was originally set up as a parish by the French Catholic Church. For almost 200 years the Saint Cyprien and Napierville names have coexisted, were confused, and have long been considered interchangeable. There is only one Catholic parish and only one school board, and the two entities have shared the territory for over a century. Even today their community life is closely intertwined. I discovered new depths of French-English-American-Canadian cross-cultural history from exploring this little place. The town was named after an English gentleman who had inherited a Seigneurie from his father, a legacy of the days of Québec being part of New France. After the British took over the French-controlled regions of Canada, the Constitutional Act of 1791 divided the province into French-speaking Lower Canada (later Quebec and Labrador) and English-speaking Upper Canada (later Ontario). Lower Canada was simply downriver from Upper Canada. The British Crown granted each colony its own legislative assembly, with a combination of members who were elected by property owners or appointed by the Crown. Reformers viewed the governments in both provinces as illegitimate, and they demanded a radically more democratic government. 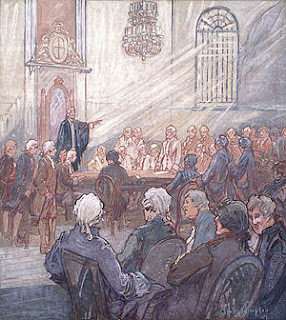 Canadian rebels and reformers took their inspiration from the republicanism of the American Revolution. They believed that the right of citizens to participate in the political process through the election of representatives was the most important right, and they sought to make the legislative council entirely elective rather than appointed. Conflict between the elected and appointed legislators brought all legislation to a halt, leading the Tories to impose Ten Resolutions that allowed them to rule without elected accountability. In response, reformers in each province organized radical democratic "political unions." In Lower Canada the Patriots organized the Société des Fils de la Liberté ("Sons of Liberty"). The organization organized protests, and eventually rebellion. The Lower Canada Rebellion was exacerbated by “racial” tensions between the English and the French, and so it involved deeper passions than the legislative conflicts that disturbed 'English' Upper Canada. Also in Lower Canada, the wealthy and ultra-conservative Catholic clergy supported the continuation of a feudalistic, agrarian society. They discouraged economic and political liberalization and thwarted the ambitions of the rising French-Canadian middle class, which was largely spearheading demands for reform. The Lower Canada rebellion was widely supported by the populace, resulting in mass actions over an extended period of time, such as boycotts, strikes and sabotage. In July 1837, a meeting of the Patriotes du comté de L'Acadie (Patriots of Acadia County) took place at Napierville. They adopted 19 resolutions calling for reforms in government. A week later, still in Napierville, a meeting of the Loyeaux (Loyalists) was held. These were local volunteers, ready to take up arms against their Patriot neighbors. As the situation in Lower Canada approached crisis, government troops and militias were concentrated in Lower Canada to deal with the crisis. In February 1838, 300 armed militia men were sent to Napierville to prevent the holding of Patriotic assemblies. Patriots continued to organize and recruit new members. On 4 November 1838, the leader of the Patriot movement, Dr. Robert Nelson, arrived in Napierville and proclaimed the provisional establishment of the Republic of Lower Canada. Several different flags were created to represent hits new republic. This one was flown in November 1838 in Napierville during Robert Nelson second declaration of independence of Lower Canada of which he was declared President. This is a flag described in J-P Bernard's, Rebellion de 1837-1838, p. 128. The description only says "a big white flag with three stars". They were believed to be blue stars. In the days following, the Patriots faced more and more armed loyalists. Meanwhile, the Governor General of Canada arranged to suppress the uprising by sending an initial contingent of regular soldiers. Other troops joined this army to form a combined force of 6,000 to 7,000 men. On November 10, 1838, Colborne and his troops arrived in Napierville and began the repression. In the following weeks, the volunteers and militia from the Upper Canada scoured Napierville, Saint-Cyprien and the surrounding parishes in order to capture the Patriots. Government troops inflicted harsh punishments on the Patriots, such as the burning of entire villages. At Napierville, over twenty houses were looted and burned. Hundreds of people fled to the U.S. to escape arrest, including 10 accused of "murder" who faced the death penalty if they ever returned. The British military crushed the rebellions, ending any possibility that the two Canadas would become republics. After the rebellions died down, more moderate reformers gained credibility as an alternative voice to the radicals. When the British government sent Lord Durham, a prominent reformer, to investigate the cause of the troubles, they were influential in the eventual establishment of elective government for the colonies, one of the rebels' original demands. Durham also recommended the merging of Upper and Lower Canada into a single political unit (the Act of Union), which became the nucleus for modern-day Canada. More controversially, he recommended the government-sponsored cultural assimilation of French Canadians to the English language and culture. During these conflicts, some Loyalists and many Patriots had suffered significant material losses due to the looting, theft, and fire on their properties. After many claims for restitution and protests against injustices and excesses of the violent suppression, a law was passed in 1849 to compensate all affected citizens without distinction between "the Loyal and the Treacherous." The engraving on this monument reads: "It is here that the Republic of Lower Canada was proclaimed on November 4, 1838, by Robert Nelson" and "I remember." Note the number of individuals who are marked "pendu" (hanged) and exilé (exiled).